In April of 2016, the West Shore Regional Police proposed adding a K-9 unit to the department. Due to budget constraints, the department knew they would need community support and donations to make the K-9 unit a reality. Officer Christopher Conroy, who is now the department’s K-9 handler, presented the idea to area residents and businesses to raise money. The initial cost to establish the unit was about $80,000. “There are a lot of costs that go into a K-9 unit; the dog, initial training for the dog and handler, and a specialized vehicle, to name a few,” said Chief of Police Michael Hope. In a short six months, Officer Conroy raised enough money to start the program. Conroy and K-9 Maximus Winston completed the K-9 academy and the unit became active November 1, 2016. The unit now assists with narcotics, searches, article searches and tracking. A partnership between Splashwire and the West Shore Regional Police began years ago when Chief Hope attended an open house hosted by the company. The police department prefers to support local businesses, and Splashwire had the technology and networking solutions the force needed. 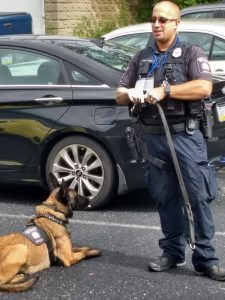 During a recent company event, Splashwire invited customers to join in donating funds to keep the department’s K-9 unit on the streets in Wormleysburg and Lemoyne. In total, including Splashwire’s match, $1,250 was raised and donated to the K-9 unit.